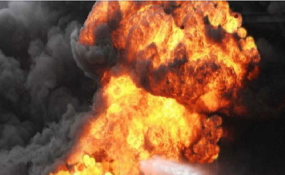 Umuahia — THE death toll from last Friday's Osisioma pipeline explosion in Abia is said to have risen to over 24, even as Eze Ikechukwu Chiavoghilefu, Chairman, Osisioma Local Government Traditional Rulers Council, put the figure at 150. According to the monarch, "about 70 persons were packed to the health clinic near my palace on the first day it happened. All of them are now dead. Up to 150 have so far died." According to Eze Mgbarime, "when the leakage occurred, some security men arrived the place and, instead of doing their job, they were collecting N1,000 from each person that came to scoop fuel there. "We learned that three of them also died when the fire started." "I came and I have seen a lot of damage. So many lives were lost; houses and farmlands destroyed," he lamented. He expressed grief over the incident which he described as "a disaster of unimaginable magnitude."